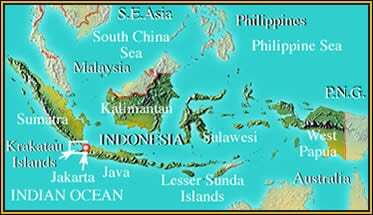 Location: Krakatau is actually located ‘west’ of Java, south of Sumatra. On August 27th 1883 the volcanic Indonesian island of Krakatau did not so much erupt, as explode with a force of more than 10,000 atomic bombs. Most of the physical island was destroyed, leaving a huge crater into which the sea rushed. All life was wiped out on the remaining island fragments and volcanic ash and boulders rained down on neighbouring islands. The resultant tsunami killed 36,000 people on the coasts of Sumatra and Java. Over the ensuing 120 years scientists have observed and recorded plant and animal species as they struggled to recolonise the Krakatau Islands. There have been set-backs such as the 1930 appearance of Anak, ‘Krakatau’s Child’, and subsequent annual eruptions which threaten to return the islands to desolate moonscapes. Australian biologist Simon Cook has been visiting the islands for several years, braving flying volcanic ‘bombs’ and poison gas clouds to study how life has returned to this hostile environment. Fascinated by the resilience of life, Mark decides to accompany Simon to the Krakatau Islands to investigate specifically how reptiles have recolonised these once sterile islands. Simon has some theories about rapid evolution in lizards he want to test and Mark is keen to find out which snakes have re-established themselves in the fragmented forests. But they must keep one eye on Anak at all times! 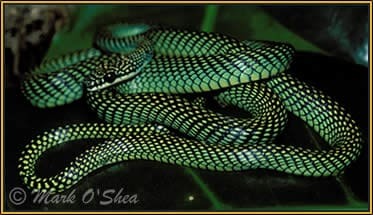 The agile Paradise flying snake (Chrysopelea paradisi paradisi) is the only colubrid snake recorded from Krakatau since 1883.